"SAMPLE LIBRARY OF THE YEAR AWARD"
Imagine typing words into your computer, in any language, and hearing a world class Symphonic Choir sing those words in any key(s) you play "live" on your keyboard controller! Well imagine no more, that´s exactly what this revolutionary "award-winning" virtual instrument does. In addition, this is the first 24-bit Choir virtual instrument to include three simultaneous stereo mic setups (close, stage and hall), so users can mix any combination of mic positions to control ambience. The Choirs were recorded in the same concert hall, by the same team as the EastWest/Quantum Leap Symphonic Orchestra and blend perfectly with EWQLSO. WordBuilder is the word building software that enables Symphonic Choirs users to type in words for the Choirs to sing. This software - included in PLAY - runs on both MAC and PC, and includes a pop-down menu that includes 28 popular Latin phrases that you can load instantly. Many choirs sing in Latin so this is a real time saver for those on a tight deadline. The phrases have been optimized for each Choir. The pop-down menu is completely customizable so users can add their own phrases to the menu for quick and easy access. ADVANCED WORDBUILDER UTILITY INCLUDED IN PLAY! PLAY is a 64-bit** (with 32-bit compatibility) Advanced Sample Engine with built-in Network Control* (plug-in or standalone). 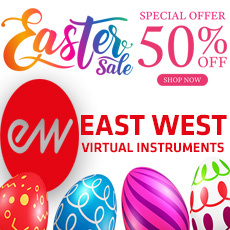 PLAY is Included with all new EASTWEST/QUANTUM LEAP Virtual (software) Instruments. 64-bit support** allows you to load many more instruments and voices, limited only by your system RAM. Easy authorization system puts licenses on hardware iLok, allowing you to take your software on any computer. Natively supported in all major hosts on all major operating systems - PLAY no matter what your platform. More native support than any other plug-in. Boys choir and some solos are good, but world builder is useless. Good quality. Like the ability to sing words (I'm still learning the tricks). This is my first sample library, however I can tell how high quality the samples are, and the articulations and keyswitching are very useful for any DAW and performance. The built-in convolution reverb is more than satisfactory. The bass shouts are perfect for any Lord-of-the-Rings-esque epic.